For inquiries on five (5) and six (6) bedroom home packages at Wintergreen Resort, please contact our Wintergreen Homes Representative by phone at 888-519-0382, or by email at wintergreenhomes@cidentertainment.com. Q: Do the Lockn’ Hotel Packages have a minimum age? A: Lockn’ is open to people of all ages! However, all persons must be 21+ to reserve and check into the Wintergreen Resort. Persons under the age of 21 years may still occupy a room; however the person whose name is booked for the reservation must be 21 years of age to check in. Please be sure to bring valid photo identification and a credit card for incidentals. Q: How will I receive my tickets? 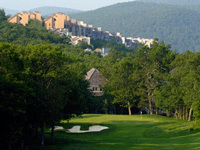 A: CID Entertainment will host an event check-in at the Wintergreen Resort for your convenience. Event check-in is where you will pick up your tickets, shuttle passes, merchandise and other package information. There will be an email sent closer to the event with the exact location, days and hours of event check-in. Q: What time is check-in at the Wintergreen Resort? A: All guests can check-in for their lodging with the resort front desk beginning at 4pm each day. Please visit the front desk upon arrival if you would like to request early check-in. The resort will do their best to accommodate these requests; however, early check-in cannot be guaranteed. A: Yes. After you check-in, the front desk will direct you to the parking space for your unit. Q: How far is the Wintergreen Resort from the festival? A: The resort is about 28.5 miles from the festival and approximately 45 minutes drive away from the festival. Please note that travel time may vary depending on festival traffic. Q: How often will the shuttles be running between Wintergreen and Lockn’? A: The shuttles will run to and from the festival at a few convenient times each day. The exact shuttle schedule with times and pick-up locations will be provided in an informational email sent out about a week before the festival, and again at event check-in. Q: Do I need to purchase a festival-parking pass? A: If you plan to use the recommended complimentary shuttle service that comes with each Travel Package you will not need a festival-parking pass. If you plan to drive a personal vehicle to and from the festival site each day and park at the festival then you will need a festival-parking pass to do so. Q: The people attending the festival with me may be arriving late. How can they check-in at the hotel and get their tickets and merchandise? A: The original purchaser must pick up everyone’s tickets and merchandise upon check-in, and they should plan to distribute to the group accordingly. We advise everyone arrive at the hotel all at once. If you list your guest’s names on the reservation with the Wintergreen when checking in with the front desk, they will be permitted to access the room upon arrival, without the original purchaser being present. Q: I purchased packages for my family, but I will not be in attendance. Can they check-in at the hotel on my behalf? A: The original purchaser must contact our Guest Services team at 888-805-8930 or guestservices@cidentertainment.com to authorize an alternative pick-up person at least two (2) weeks prior to the event date. This authorization will allow a friend or family member to pick up the package on the purchaser’s behalf. All informational emails and correspondence will still go to the original purchaser and it is up to them to relay the information to the guest who is attending the event. A: Yes! An initial 60% deposit is needed to reserve your travel package followed by a 40% payment due on 6/08/2016. The final payment will be automatically charged to the same card used for the deposit. A: All travel packages are non-refundable. Please refer to the Purchase Policy for complete details.